The Binghamton University School of Management was founded in 1970 and has AACSB Accreditation. The School of Management offers bachelors, masters, and doctoral degrees in management, finance, information science, marketing, and accounting. 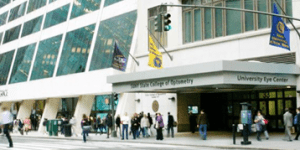 The Binghamton MBA program in New York City is located within the State University of New York College of Optometry in midtown Manhattan. The building is directly across from Bryant Park, where many students spend time between classes. Many public transportation options, including Grand Central Terminal and Port Authority, are within a 10-minute walk. The Professional MBA program is held in Aeolian Hall, a former concert hall into which the SUNY College of Optometry moved in the late 1990s. As a whole, the Binghamton campus is nearly 900 acres, including a 190-acre nature preserve. The Binghamton School of Management employs 50 faculty members. A total of 40 students are currently enrolled in the Binghamton MBA program. More than half (61 percent) of the class come from outside of the United States. Students enter the program with a 3.5 GPA. It currently offers a traditional and Professional MBA, as well as a Masters of Science in Accounting and Ph.D. graduate programs. The Professional MBA is offered in New York City, rather than on Binghamton University’s main campus in central New York.